The revolution has begun. 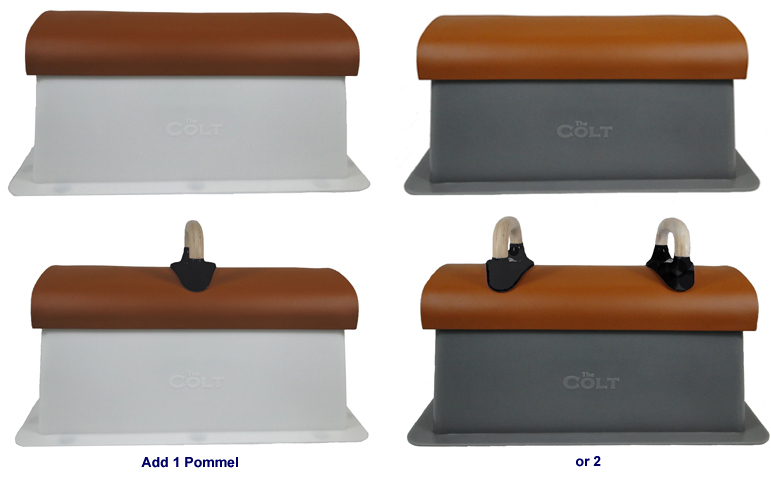 The long awaited Pommel Horse trainer, The Colt, is ready to ship right away. Designed by coaches, The Colt is the exact shape of a Pommel Horse at half the length for the most realistic feel to the real thing, in a size that allows for training in a safe format without a spotter. This versatile trainer features 3 handle placement locations: center and both ends (regulation width apart). Customize yours for the skill you are working on. The Colt is light enough to be easily moved (40 pounds without pommel handles). It’s a super trainer for use in the gym or at home, and the ideal apparatus for introducing or perfecting most Pommel skills for athletes at all skill levels, including Special Olympic Programs. Also great for building and maintaining aerobic and strength fitness. Footprint: 20" x 35.5", Padded top: 13.75" x 30.5", Height to top of padded top: 15 3/8". Sturdy molded polyethylene base with padded Tuff-Hide (leather-like) top - The new more durable Tuff-Hide is new in 2015! The pommel handles are not included - unless you add them by selecting them below. Most brand's pommel handle will fit. We have handles available in singles or pairs below. The handle's base will be black. Available with White or Gray base. FREE SHIPPING inside the continental US (lower 48 states). Ships within 1 week. Proudly made in the USA.